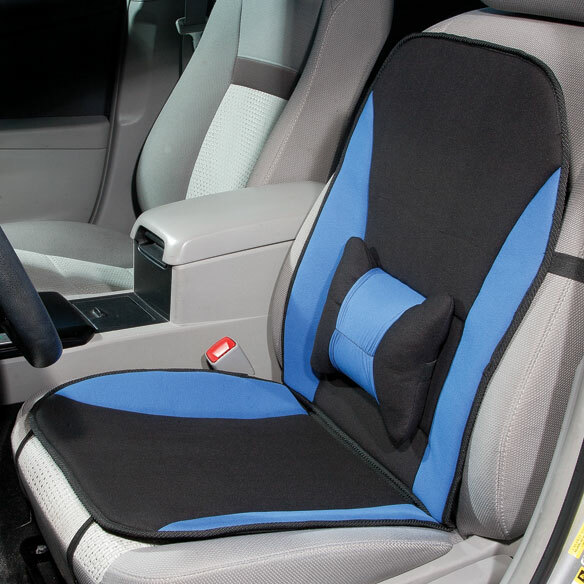 Pressure-relieving memory foam seat cushion with lumbar support adds comfort to any seat. 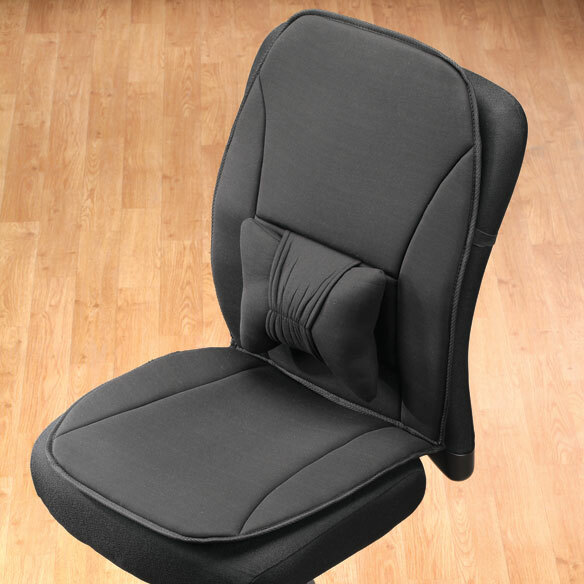 Removable lumbar support cushion cradles the lower back, helping to encourage good posture and reduce discomfort. Memory foam cushion doubles as a neck support, perfect for naps in the car. 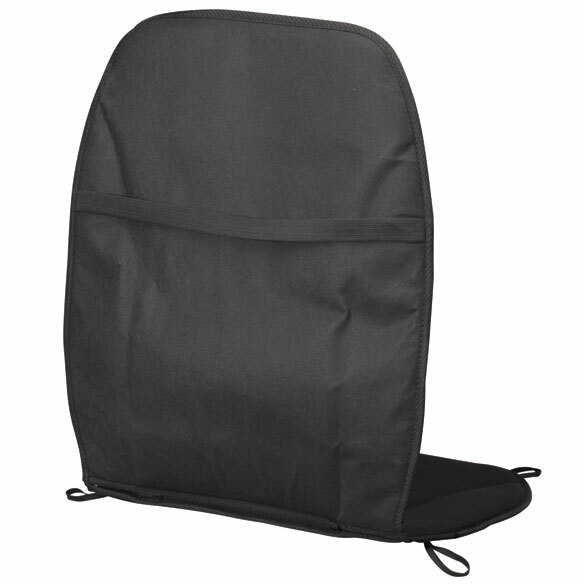 38 1/2”L overall; back is 21 1/2”L x 18”W; seat is 16”L x 18”W. 50% polyester/35% nonwoven fabric/10% foam/5% EVA. I purchased to put in my car. Leases my back pain tremendouslu. I put this on my desk chair and it fits a bit long. I took out the lumbar support because it was in the wrong place. Now it is super comfy for what I purchased it for.....Thanks C.J. I am so happy I made this purchase, I have a bad back and have to drive long distances where I live, this car seat has made my life a whole lot better. It is the best chair additive ever. support for his back. This does the job very well. LUMBAR SUPPORT DOUBLES AS REMOVABLE PILLOW. FAIRLY COMFORTABLE & GOOD BUY IF YOU DRIVE ALOT. I purchased this product so it would give some support for my back. It is so thin and the little pillow that is suppose be a little more support for you back does not give much support. It doesn't stay where you put it. Not what is advertised to look or feel like. It is not anything near to what the picture looks like or how it was described. It was hard to attach and it was not nearly as thick or shaped the way it looks in the picture. I am very disappointed with the product. Back comfort. Let's see how it works! IT SEEMS THAT IT COULD HELP MY BACK WHICH HAS SEVERAL PROBLEMS. I have a compressed vertebrae in my spine along with severe spondolosis from my neck to my lower back. Sitting can be quite painful. I saw this and grabbed it! Very deceiving as it is too this for any comfort. I read what other people had to say about them. This is for my Disabled Daughter who sits during the day and needs the added comfort for her back. For a more comfortable sit. I am looking for a seat for a wheelchair that I need to use temporarily. This item looks perfect for the purpose, and does not cost hundreds of dollars. I am going to try this one and another one I've ordered, so as to decide which one serves me best. I like the way yours looks the best. I am not comfortable driving in my Honda Accord. How thick is this cushion? 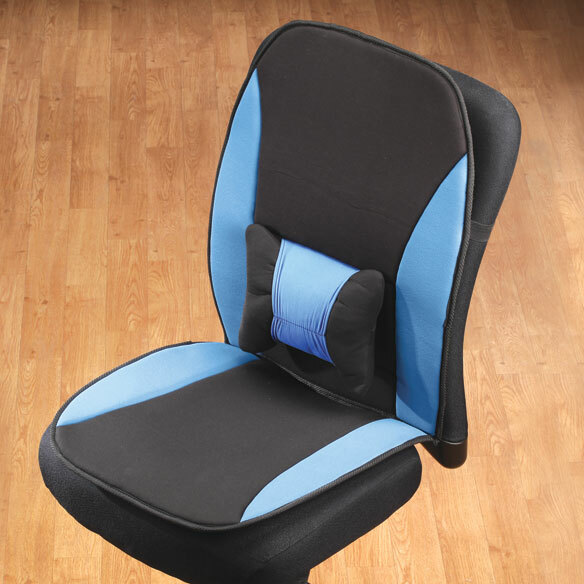 My mom needs lumbar support in her wheelchair and also uses a wheelchair cushion. Is the seat thick enough to dispense with the 2" cushion or do I need to buy one of each? BEST ANSWER: Thank you for your question. The cushion is 3/4" thick. We hope this information will be of help to you. What is the weight of this seat? I'm almost 80 and suffer from severe back pain from a Lamanectomy with fusion on the (5) lower lumbar I had 6-7 years ago. BEST ANSWER: Thank you for your question. This chair weighs 1.1 lbs.We hope this information will be of help to you. do you have a car seat with neck support also? In the description it states "Memory foam cushion doubles as a neck support"
It has four loops and eight hooks.. How does one attach to the car seat.? BEST ANSWER: Sorry I did not know what to do with those either, I just put the strap around my seat. Have a bad back and it helps when I am especially driving long distances. I got 1for my husband and he really likes the way it supports his back. Would recommend buying one. Can it be used on a Bariatric Recliner? BEST ANSWER: Yes , I believe it can. It is relatively thin, and will lay flat. 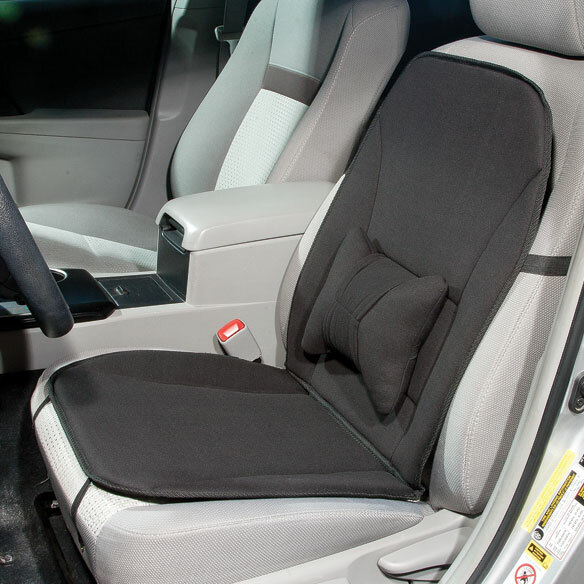 The lumbar pillow detaches so it could be moved to be in the appropriate spot for you. Can you show how it's attached to a car seat? BEST ANSWER: Thank you for your question. Yes, look at the pictures below the large picture. We hope this information will be of help to you. Will it work for someone who is obese? Say around 300lbs? BEST ANSWER: I just received my car seat today. It is very easy to install. I especially appreciate the hooks that were enclosed to anchor the seat to my car seat frame so it won't slip "n" slide around. As for the weight issue, I afraid that can't answer that fairly because I weigh under one hundred-fifty pounds.